The War Memorial is a circular column of Woolton red sandstone crowned with a figure representing mourning and set in a semi-circular stone bend. It was designed by the Liverpool sculptor, Herbert Tyson Smith and was dedicated on Sunday 24 May 1925. 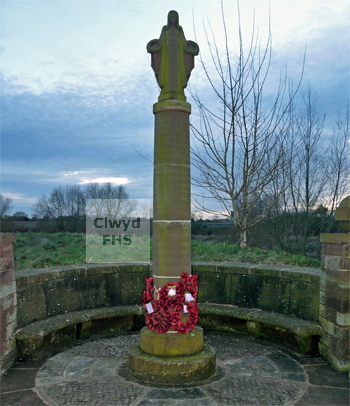 The memorial stands in front of St. Dunawd's Parish Church, on the banks of the River Dee. The village of Bangor is y Coed sits on the banks of the River Dee in the ancient district of Maelor, in the the County Borough of Wrexham. Until 1974 the area was part of the historic county of Flintshire and from 1974 to 1996 in the county of Clwyd. 23146 6th Bn. King's Own Yorkshire Light Infantry 6 Jan 1916 27 Son of Benjamin & Mary Richardson Boffey, of Whitchurch Road, Bangor is y Coed. New Irish Farm Cemetery, Ieper, West-Vlaanderen, Belgium. 54278 9th Bn. Royal Welsh Fusiliers 28 Oct 1916 Thiepval Memorial, Somme, France. 22601 6th Bn. The Queen's (Royal West Surrey Regiment) 17 Feb 1917 25 Son of Frederick & Kate Fearnall, of Pickhill Old Hall, Pickhill, Wrexham. St. Hilaire Cemetery, Frevent, Pas de Calais, France. 4596 1st Life Guards 19 May 1918 20 Son of Mrs. Fenwick, of Plas Fron, Wrexham, and the late Capt. George Fenwick, Royal Welsh Fusiliers. Etaples Military Cemetery, Pas de Calais, France. 32538 14th Bn. Royal Warwickshire Regiment 26 Oct 1917 24 Son of Hester Goswell, of Cross Lanes, Wrexham, and the late George Goswell. Born at Bangor is y Coed. Hooge Crater Cemetery, Ieper, West-Vlaanderen, Belgium. M/272702 348th M.T. Coy. Army Service Corps 23 Oct 1918 28 Husband of H. L. Gravenor, of Porthygan, Bangor is y Coed. Born at Bodenham, Herefordshire, England. Bodenham Chapelyard, Bodenham, Herefordshire, England. 8149 2nd Bn. Royal Welsh Fusiliers 10 Jun 1915 30 Husband of Sarah Louisa Haycocks, White Gate Cottages, Gyfelia, Wrexham (1911 Wales Census) later Matthews. Also named on the Ruabon War Memorial. Bailleul Communal Cemetery Extension, Nord, France. Denbighshire Yeomanry 20 Apr 1918 21 Son of George & Mary Humphreys, High Street, Bangor is y Coed. The Lakes, Bangor on Dee (1911 Census). Tyne Cot Memorial, Ieper, West-Vlaanderen, Belgium. 49752 1st Bn. Cheshire Regiment 5 Oct 1917 32 Son of George & Mary Humphreys, of High Street, Bangor is y Coed. Tyne Cot Cemetery, Ieper, West-Vlaanderen, Belgium. 33148 "B" Coy. 1st Bn. Cheshire Regiment 19 Sep 1916 22 Son of John & Elizabeth Lloyd-Jones, of Glan Aber, Hope, Wrexham. Thiepval Memorial, Somme, France. Frank Stuart Lloyd 13th Bn. Royal Welsh Fusiliers 5 Sep 1917 24 Son of Francis and Fanny Lloyd, Eyton House, Bangor is y Coed (1891 Wales Census). Dozinghem Military Cemetery, Poperinge, West-Vlaanderen, Belgium. 6563 1st Bn. Royal Welsh Fusiliers 30 Oct 1914 35 Son of Joseph & Eliza E. Matthews, of Mill Brook Bank, Bangor is y Coed; husband of Jane E. Matthews, of Bangor is y Coed. Menin Gate Cemetery, Ieper, West-Vlaanderen, Belgium. M.C. 1st Bn. Royal Welsh Fusiliers 25 Aug 1917 28 Son of Oliver & Emily Westropp Harrison Moreland Ormrod, of Pickhill Hall, Pickhill, Wrexham. Brother of Lionel James and Oliver Hugh Moreland Ormrod (below) St. Dunawd's churchyard, Bangor is y Coed. ORMROD 12th (Prince of Wales's Royal) Lancers (resigned) 03 May 1915 32 Son of Oliver & Emily Westropp Harrison Moreland Ormrod, of Pickhill Hall, Pickhill, Wrexham. Brother of Lawrence Moreland Ormrod (above) and Oliver Hugh Ormrod (below). Not named on the War Memorial. St. Dunawd's Churchyard, Bangor is y Coed. ORMROD Royal Flying Corps formerly Royal Field Artillery 12 Sep 1916 30 Son of Oliver & Emily Westropp Harrison Moreland Ormrod, of Pickhill Hall, Pickhill, Wrexham. Brother of Lawrence Moreland and Lionel James Ormrod (above) St. Dunawd's churchyard, Bangor is y Coed. 25305 16th Bn. Royal Welsh Fusiliers 8 Nov 1918 28 Born in Cefn. Son of Stephen Rees and the late Catherine Rees, Vedwygoed Farm, Eyton, Wrexham. Also commemorated on the Cefn Mawr War Memorial. Dourlers Communal Cemetery Extension, Nord, France. 81022 2nd Bn. King's (Liverpool Regiment) 27 Feb 1917 39 Husband of Elizabeth Rogers, of Station Road, Bangor is y Coed. Lembet Road Military Cemetery, Salonika, Greece. 35213 6th Bn. Royal Berkshire Regiment 10 Aug 1917 19 Son of William & Elizabeth Shone, of "Cloy Villa", Bangor is y Coed, Wrexham. Menin Gate Memorial, Ieper, West Vlaanderen, Belgium. William Stant 56766 10th Bn. Royal Welsh Fusiliers 14 Jun 1917 19 Son of Harry & Margaret Stant, of Church Avenue, Bangor is y Coed, Wrexham. Arras Memorial, Pas de Calais, France. 230744 King's Shropshire Light Infantry 30 Nov 1917 27 Son of Edward Grover and Mary Elizabeth Studley, Caedia, Overton, Flintshire (1891 Wales Census). Born Overton. Jerusalem Memorial, Israel. Placed by the former rector Rev. R. J. B. and Mrs. Paterson Morgan in grateful remembrance of the 23 Bangor men who fell in the War. From Mr. Oliver Ormrod of Pickhill Hall, to the memory of three of his sons, a great loss, Lt. Col. Lionel James Ormrod, 12 Royal Lancers; Captain Oliver Hugh Hugh Ormrod, R.F.A. and R.F.C. ; and Captain Lawrence Moreland Ormrod, M.C., Royal Welsh Fusiliers. To the memory of Roger Mansell William Fenwick, the younger son of Mrs. Fenwick, Plas Fron and the late Captain Fenwick, Royal Welsh Fusiliers. To the memory of Major Guy Winwood Gossage, the husband of Mrs. Gossage, Gerwyn Hall. To the memory of Major Frank Stuart Lloyd, Royal Welsh Fusiliers, the fifth son of Mr Frank Lloyd of Eton House.